All Day Racing – Will Bayern fool the public again? Will Bayern fool the public again? I love Bayern. Why? Not because he’s an all-time great racehorse, even though he did win a competitive installment of the Breeders’ Cup Classic last year. Instead, I like him because he befuddles the public — never winning as the favorite and winning several times at high odds. This year, he’s continued his pattern, at least on the losing end of the spectrum. Tomorrow, he may present an opportunity to fool the public once again. He races at Del Mar in the Pacific Classic — and will likely be a decent price. His morning-line is 6-1 and he is facing the great mare Beholder, who is certain to take a disproportionate share of public money due to her reputation and popularity. Here’s Bayern’s complete PP for reference. Last year is covered in depth here, so let’s take a look at his three races this year. He was the 4/5 favorite in the GII Churchill Downs, a 7 furlong sprint on Derby Day. He broke slow — compared to his blistering starts of last year — and faded to finish last. In the Met Mile, he was the 7/2 second-choice behind Tonalist, who had been 4 for 4 over the Belmont surface, including 2 G1 victories over the track. He broke slow again, was rushed to the lead, and faded to finish last once again behind 6-1 winner Honor Code. 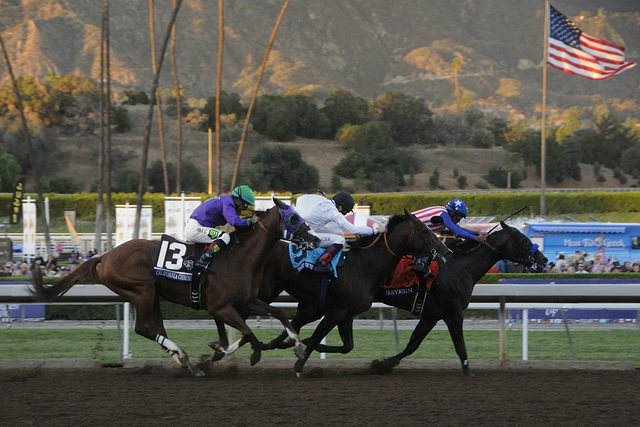 He raced at Del Mar in the prep for this week’s Pacific Classic in the G2 San Diego Handicap. Favored once again at 7/5, he ran his best race of the year, but still significantly below his best efforts of the past. He broke better, but eventually lost a protracted battle with Appealing Tale (who has nabbed at the wire by Catch a Flight). All three of these races have been shorter than the Pacific Classic distance of 10 furlongs (the longest was 8.5f in the San Diego). Bayern has shown that he excels at longer distances, running a career-best 113 in the 10f challenge of the Breeders’ Cup Classic. In contrast, last year’s debacle at Saratoga in the Travers was based on over-optimism following his impressive Haskell — he was originally targeted for the King’s Bishop — and is not representative of what he can do at the distance. With the public likely believing that Bayern has lost a step and not considering the distance question, he should offer value on Pacific Classic Day. And with his past record of fooling the public, it wouldn’t be a surprise to see him win at juicy odds once again. Image: Scott Ableman, Copyright 2014.